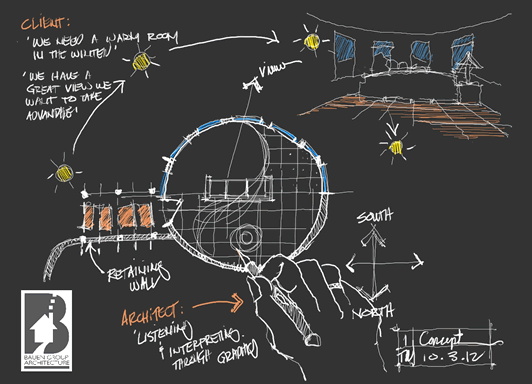 We, as architects creating architecture, are artistic and scientific translators. 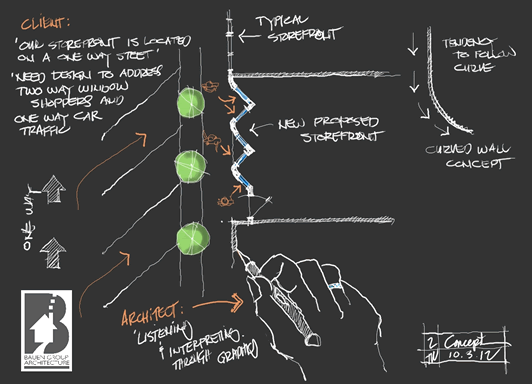 We listen closely to clients, visit sites and study context to publish a document called a ‘design program’. This document serves as a guide or outline that details the wants and needs of the client, the context of the project site, regulatory agency requirements, site conditions, solar orientation, design styles, lifestyle of the users and many other factors that contribute to a constructing a building or home. We are artists that take all these program items and translate them into three-dimensional space. ‘Firmitas, Utilitas et Venustas’—three words long ago coined by Roman architect and engineer, Vitruvius. These three words translate to ‘Strength, Utility and Beauty.’ Bauen Group designers use these three words as a cornerstone reminder of our purpose as we embark on each design journey large or small. Client Language: We are redesigning our retail storefront and we are located on a one way street. We would like for people to notice and easily identify our business and products.